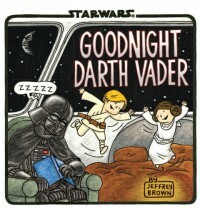 This was a charming and adorable idea in [b:Darth Vader and Son|13163846|Darth Vader and Son|Jeffrey Brown|https://d.gr-assets.com/books/1392020416s/13163846.jpg|18342898] but now it begins to wear thin. Vader is trying to get the twins to go to bed and they want a story. He tells them this rhyming ditty that covers everyone from every Star Wars movie, the cartoons, and probably a video game, or two, as well. This seemed a bit show-offy to me, sort of "Look how much I love Star Wars! I will even call the trash creature by name! (Dianoga) I'm the most Star Warsy fan of all fans." The rhymes are often forced and the couplets follow no set meter. It's clunky and I would be very frustrated if I had to read this out loud. To me, this is definitely a case of "too much of a good thing" not being so great.